Taxidermy is a fundamental technique for preserving vertebrate animal remains. Essentially it's a method of preserving elements of an animal for study or display after the animal has died. Many people first see examples of taxidermy whilst visiting natural history museums and marvelling at the lifelike results of top Victorian and Edwardian taxidermists like Rowland Ward or Edward Gerrard & Sons, but the technique encompasses far more than the diorama we see in traditional displays in museums and stately homes. Taxidermy is also used in the production of 'skins' and 'mounts' for scientific study rather than exhibition. The term taxidermy comes from the Greek taxis 'arrangement' + derma 'skin', which at its simplest level is what the process is all about. 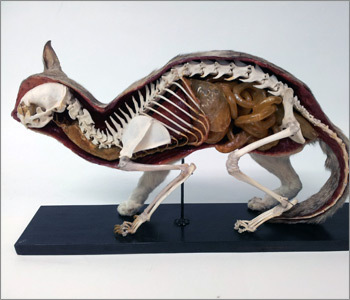 Put simply, the skin of an animal is cleaned and preserved and then stretched onto a 'body-shaped' frame, usually modelled on the animal itself. The 'mounted' animal can then be adjusted to provide a reproduction of the creature in life, or in the case of scientific collections, a reference specimen from which accurate measurements, observations and even samples can be taken. In the 19th and early 20th centuries the production of items of furniture such as those from Hippopotamus and Rhinoceros feet was acceptable in society, but thankfully times have changed. Ironically however the same period provided museums round the world with millions of skins and mounts, carefully preserved by taxidermists, which remain an essential resource for study both now and for future generations of zoologists. The process of preserving skins can be traced back to the beginnings of civilisation, and despite changing social attitudes to the display and use of an animal's dead body, a great deal on information is gained annually by the study of this preserved material assembled in museum collections. Each specimen is biologically unique and represents an individual encapsulated in a moment in time, allowing us to examine animals, which may have been dead for many years. Indeed, some of the earliest surviving taxidermy dates back to the late 18th century, but unfortunately, very few examples from this period survive. Yet, the remnants of a few historically important specimens still survive after more than 250 years, including examples contained in the collection of Sir Hans Sloane (1660-1753), a physician, naturalist and collector, whose collection formed the basis of the British Museum that can still be studied to this day. Taxidermy has also preserved important specimens from some of the world's greatest historic expeditions and a few intact bird specimens collected on the voyages of Captain James Cook (1728-1779) still survive and are held at the Natural History Museum at Tring in Hertfordshire. As science has advanced the techniques used to preserve specimens have been transformed. Two hundred years ago, poorly prepared specimens may have only lasted a few decades before they fell apart or were eaten by pests. Nowadays we understand how to make the very best use of biological specimens and how to best preserve them. We store specimens in temperature and humidity controlled environments to prevent damage resulting from changes in the atmosphere and protect them from insects, dirt and physical damage and the destructive fading that can occur on exposure to too much light. Rare species can be preserved using a number of specialised techniques to ensure they can be studied in a wide range of ways. Recently the Natural History Museum obtained the corpse of a captive bred Uvea parakeet (Eunymphicus uvaeensis) that died of natural causes. A skilled taxidermist prepared this endangered specimen as a study skin with a replacement cast skull, a spread wing, and a partial-skeleton (including skull, a wing and a foot). We also kept frozen tissue samples to allow molecular and biochemical tests to be undertaken in the future. In some cases we can also preserve the skinned torso or organs from a specimen in alcohol, so that they can be dissected in the future. These advances in taxidermy techniques allow scientists both now and in the future to study these important specimens in almost every conceivable way. Skins held in collections are central to our understanding of population distributions and evolution. Indeed certain designated specimens called taxonomic 'types' make the system we use for naming organisms stable by connecting the published scientific name to an actual specimen or set of specimens, which then serves as a standard reference for the taxon. Lastly and by no means least, in some cases, like that of the Great Auk (Pinguinus impennis) a north Atlantic seabird which became extinct in 1844, those few remaining specimens in museum collection are the only way of studying the species and represent are a reminder of the importance of conservation before time runs out.